Test results were released by researchers on November 19th regarding the mummified remains reportedly found near Peru’s Nazca Lines in 2015. The results, released in both a video online and reports published to the Alien Project website, came following a live presentation in the Congress Hall of the Republic of Peru and claim to show that the mummies are "a new or unknown species with a unique biological evolutionary origin distinct from that known in the human species or in any other." 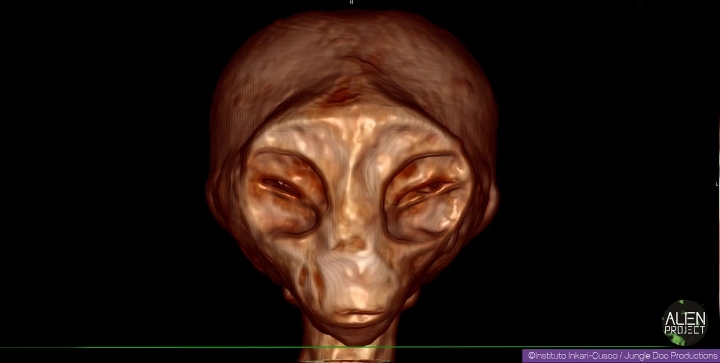 "At the congress it has been demonstrated by a number of scientists who have analyzed the famous Nazca mummies [that their remains] present anomalies, especially the smaller alien mummies (60 cm high), which are completely different from any human," wrote UFO website Segni dal Cielo in a summary of the video, which is in Spanish. 1) DNA results confirm that the samples have no direct relationship with any organism similar to an animal known or described to date. 2) The results of the Carbon 14 tests show that there is a period of approximate dating, which implies a different taxonomic origin from that known or described in terrestrial species already studied and reported by science. 3) The bones of the mummies are empty, like those of birds, but very rigid, like those of some dinosaurs. There is also a natural wear between the joints and bones, demonstrating that the samples could not have been assembled, but belonged to whole beings that were alive. 4) The studies performed with 3D CT and 3D MRI with three-dimensional scan reconstructions have identified the bone anatomy, as well as the ovoid structures (4 eggs found inside one of the 60 cm mummies), the anatomy of the skin, fat, muscles, blood vessels, oral cavity (muscles, tendons, ligaments and cartilages) have a direct relationship between their position and trajectory, thus demonstrating their unique and unrepeatable organic authenticity and functionality among individuals. (5) All collected data indicate the feasibility and truthfulness that [the mummies represent] a new or unknown species with a unique biological evolutionary origin distinct from that known in the human species or in any other. The examination of the mummified remains has been controversial since they were first presented, with accusations of grave robbing levied against the researchers by the mainstream archaeological community. The 9th annual World Congress on Mummy Studies, held in Lima, Peru in August of 2017, issued a call for an official inquiry into whether archaeological crimes had been committed. The impassioned call, entitled "The Fraud of Extraterrestrial Mummies," was released on their Facebook page. The subject is no less controversial now, and mainstream scientific authorities had major reservations following the release. "As mentioned by the Peruvian [congressman] Armando Villanueva Mercado, the Peruvian Ministry of Culture was invited to the presentation, which he later did not attend," Segni dal Cielo reported. "However, other academic guests attended, such as representatives from the archaeology faculties of universities in Peru. And of course, at the end of the presentation the archaeologists complained that they did not take part in the tests on the mummies and therefore they remained dubious about the results." Jaime Maussan is the Mexican journalist and television personality who was famously behind the controversial Roswell Slides debacle of 2015, in which a photograph of an indigenous boy’s remains taken in a Colorado museum was presented as proof of extraterrestrial life. Maussan and researcher Fernando Correa have promised to publish more results following this release.